Details: No mess Saves valuable supplements Stimulates natural feeding behaviour Ideal to 'coat' crickets with vitamins Natural look. 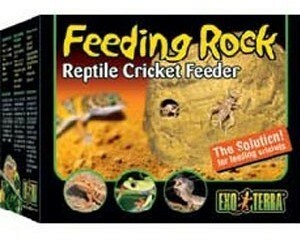 Slowly releases crickets This Feeding Rock stimulates the reptiles natural feeding behaviour. It is also a good way to coat your insects with a vitamin supplement.